What is Azelastine HCl (Opthalmic)? 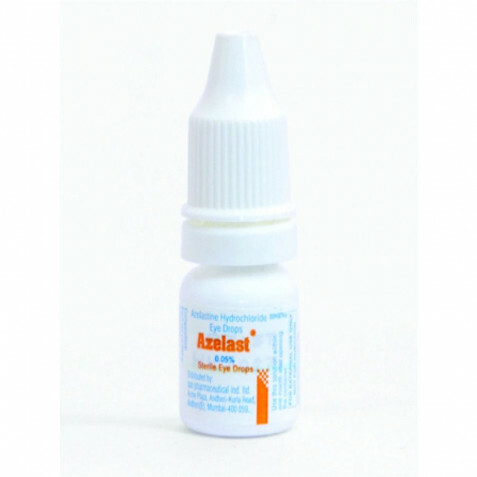 Azelastine HCl (Opthlamic) is an eye drop medication used for the treatment of itchy or watery eyes caused by allergies (hay fever). It is an antihistamine that reduces histamine (a naturally occuring chemical which produces symptoms of itchy or watery eyes) in the body. Azelastine HCl Opthalmic is sold as Optivar and Azelast (made by Sigma). This medication may also be used for conditions not mentioned above. Do not use Azelastine HCl Opthalmic (Optivar, Azelast) if you are allergic to Azelastine. Do not apply this medication in your eyes while wearing contact lenses. After applying the eye drops, wait for at least 15 minutes before wearing on your contact lenses. Avoid contact lenses if you eyes are red or irritated. Stop using Azelastine HCl eye drops and get medical attention if you have severe eye pain, trouble breathing, or severe burning, stinging, itching, or redness in your eyes. If you are pregnant or planning a pregnancy, ask your doctor if you can safely use it without affecting your pregnancy or health. Also, if you are breast feeding a baby, ask your doctor if you can use Azelastine HCl medication without affecting your baby as the medication may pass into breast milk. This medication is not recommended for children under 3 years of age. How should I use Azelastine HCl (Opthalmic)? You must use Azelastine HCl Opthalmic medication strictly as advised by your doctor. Not doing so may lead to worsening of your condition rendering the medication ineffective. Eye drops are easy to apply in your eyes. Ask for help if you are not able to adminster them yourself. Do not apply more than the required amount of medication in your eyes.. Always store Azelastine HCl eye drops in a cool and dark place, away from heat, moisture, children and pets. If you miss a dose, take it as soon as you remember it. Don't take the missed dose if the time for the next dose is near. Never use multiple doses at short intervals. An overdose of Azelastine HCl eye drops is unlikely. Do not use other medicinal eye drops while using Azelastine HCl, unless or otherwise advised by your doctor. Some common side effects of Azelastine HCl Opthalmic medications are mild burning, stinging, itching, irritation, or discomfort, runny nose, bitter taste, or headache. If any of these side effects persist or if you get a severe form of these conditions, get medical attention right away. The side effects above due to this medication are not all the possible ones that you may experience. There may be other reactions and side effects due to Azelastine HCl eye drops. You may also inform the FDA about your side effects by calling at 1-800-FDA-1088. It is unlikely that other drugs will affect the working of Azelastine HCl Opthalmic drops. However, there are several drugs which can interact with each other. Let your doctor know about all other medications which you may be using. Never start a new medication without asking your doctor.